Samsung Q2 profit was 20% lower than in Q2 2013 and 17% down on Q1 2014, mainly due to a strong Korean currency and sluggish smartphone sales, the company announced. It posted a net profit of ₩6.25 trillion ($6.1bn). The symbol for the Korean won is ‘₩’. The results come three weeks after Samsung issued a profit warning. Most of Samsung’s profit comes from the sale of mobile devices. 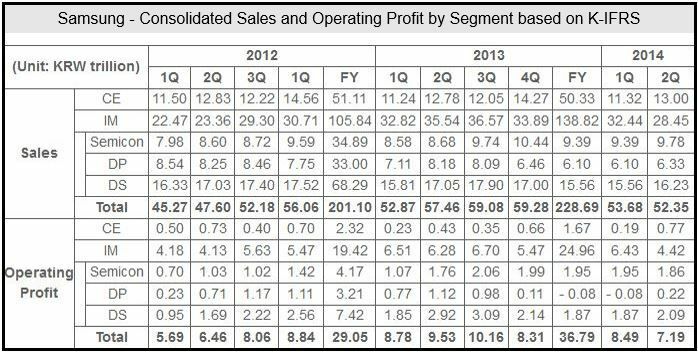 Samsung’s CEO, J. K. Shin, took the helm in 2009, when the mobile business represented one third of operating profits. In Q2 2014 they accounted for 61%. Samsung is today the world’s largest seller of smartphones. Mr. Shin’s current battle is to maintain his company’s global lead in the smartphone market which is under attack by cheap Chinese competitors and new Apple products that are soon to come. According to data published by IDC this week, Samsung’s global smartphone market share has fallen to 25% from 32% last year. The Wall Street Journal quotes unnamed people who claim to be familiar with the matter who say that hundreds of Samsung mobile unit’s senior managers have had to take a 25% cut in first half bonuses. Samsung said the strong Korean currency chipped away at its operating profit for Q2 2014, which amounted to approximately ₩500 billion in missed revenue prompted by the foreign exchange market. CE (Consumer Electronics), IM (IT & Mobile Communications), DS (Device Solutions), and DP (Display Panel). The company warned that the second half of the year will “remain a challenge.” It expects to see gains in its Consumer Electronics Division, driven mainly by shipments of premium televisions with curved and UHD (ultra-high definition) features. As competition worldwide for the mobile industry intensifies, Samsung says growth prospects remain unclear. It forecasts increased mobile device sales with the rollout of flagship products and new models, but adds that profitability may be lower as prices are cut. The negative impact of a stronger Korean currency seen in the second quarter will be less in the September quarter, Samsung believes. 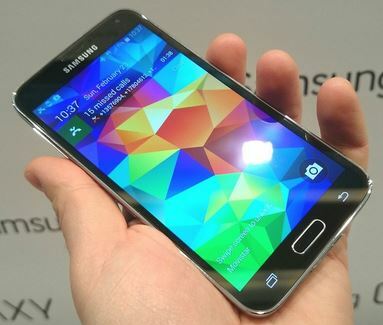 Q2 2014 was the first quarter to mark sales of the Galaxy S5, Samsung’s latest flagship smartphone. The company assured investors in February when the new smartphone was unveiled that it would sell better than the Galaxy S4, its predecessor. Will the Galaxy S5 help lift Samsung’s smartphone sales? A total of 11 million Galaxy S5s were sold in the first month, about 1 million more than during the first month of Galaxy S4 sales. Investors, who had been expecting exceptional figures, wonder whether the Galaxy S5 might disappoint. The company has released no updates on the sales of its new smartphone.